Overview: Shingle Mill Pathway Trail system in the Pigeon River Country State Forrest, is also part of the High Country Pathway Trail. The High Country pathway is a 70 mile loop extended eastward from the heart of the Pigeon River Country in Otsego County into the Atlanta State Forest in Montmorency County and northwards up into southwest Presque Isle County and southern Cheboygan County through the heart of Michigan's northern Lower Peninsula. The Shingle Mill Pathway trail system contains 5 trails of Various lengths (3/4, 1-1/4 mile, 6 mile, 10 mile, and 12 mile). This land, which Ernest Hemingway called the "pine barrens east of Vanderbilt" and what Michigan pioneer conservationist P.S. Lovejoy liked to call "The Big Wild", is home to the largest herd of wild elk east of the Mississippi and forms a major part of the watershed of three of Michigan's premier trout streams, the Sturgeon, the Pigeon River, and the Cheboygan Black. Hike: This hike description is for the 6 mile loop, clockwise. We started our hike from the Forrest Service Headquarters building where maps and all sorts of information are available. Stop inside and see some of the neat exhibits and many mounts. The actual TH for starting here is just south and west of the building right off the road. The hike starts in thick hardwood forests on a well defined trail and meanders down towards the Pigeon River staying to the south and east of the river. You get a few views of the river along the way, but stay mainly in the hardwoods. The first decision point is at Marker #3. We opted to take a left turn (SE) here, but you should be able to go straight (SW) and still end up at the same place. This next point is the Pigeon Bridge Campground. Water and Toilets are available here. This is also the area for the other TH. For us it was out to Sturgeon Valley Road to head west over the bridge and back on the trail. The trail starts out on this side in lowlands and and swampy areas for a mile or two. A good half mile of the trail is elevated on double wide 2 X 12 planking to keep you out of the soft ground after rains. The trail continues with gentle ups and downs, mostly covered from the sun and getting numerous views of the Pigeon River. Fern coverage is also prevalent in this section of the hike. The trail crosses a few dirt roads and old logging tracks until you get to the next decision point at sign #12. For the 6 mile loop that we were on, you head straight east. 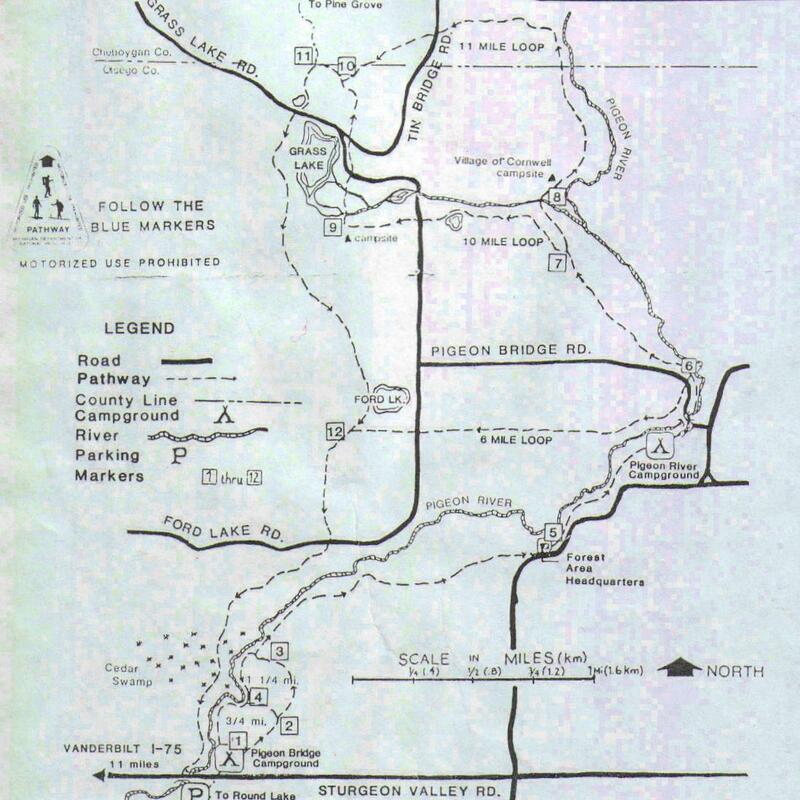 For access to the 10 and 11 mile loops, Ford Lake and Grass Lake, you would head north here. I've read that the area on the 10 and 11 mile hikes is a bit more hilly with some scenic overlooks. I guess that's where I'll head next time I'm up there. Once you get towards the end of the 1 mile almost perfectly straight section of the trail, you will begin to see the river again and you have another decision point. For the 6 mile loop and to get back to your car you'll need to go to the right on a trail, down a hill, crossing the river at the bridge. Enter the Pigeon River Campgrounds and walk through the entire campgrounds to pick up the trail one more time. In this section the trail is marked with blue dots on trees. From here it's just a mile or so to complete the loop back to your starting point. Water Sources: Artisan Wells and or Hand pumps can be found in the 2 established Campgrounds and at the Forrest Service Headquarters building. Please purify any water that comes from any of the many streams in the area. Directions provided here come from I-75 to the West. If coming from anywhere other than the west, please use the cord. provided for your directions.